The other day I caught my 3 year old being bored. She had peeled the ribbon off one of her headbands. I looked at the headband trying to figure out a way to salvage it and make it cuter. It was poorly made. The ribbon was no longer sticking. Besides it was kind of drab. So, I decided to go through my craft box and figure something out. 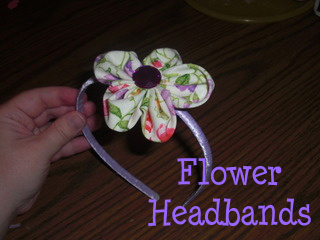 I sew a bunch of flowers at the same time and then wait to either attach them to a cloth headband or barrettes. I had never thought of putting them on a headband suitable for a toddler. I decided on the flower and went to work. You will need to sew the flower first. Directions for that can be found here on this blog. 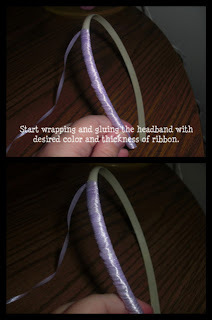 Step 1: Start wrapping and gluing the headband with desired color and thickness of ribbon. Step 2: Seal ribbon at ends with a dab of hot glue. 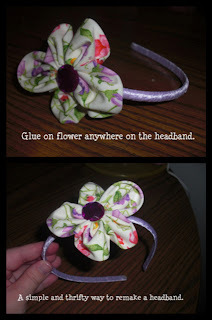 Step 3: Glue on flower anywhere on the headband. And there you have it a simple and thrifty way to make over a headband. That is so precious. What a pretty fabric flower. Hi, I just landed here from Boost My Blog Friday. I'm a brand new follower. You have a great blog! I am visiting from the Boost My Blog Friday! I am your newest follower and would love it if you would follow me back! thanks so much!